"There have been other 'Fasci' before the present, for the word, derived from Latin 'fascia' (a bandage), means any league or association. Thus, the association of laborers and sulfur-workers, that caused the agrarian agitation in Sicily in 1892, were called Fasci... the essence of the word being the close union of different elements in a common cause that binds them all together. Each 'Fascio' possesses so-called 'squadre de azione' (squadrons of action), composed of young men who have mostly served in the war. Each of these 'squadrons' has a commandant, named by the directing council of the particular Fascio." In Milan there existed a general committee that supervised all these yahoos, but by enlarge, each local Fascio was free to do as they saw fit within their own domains. 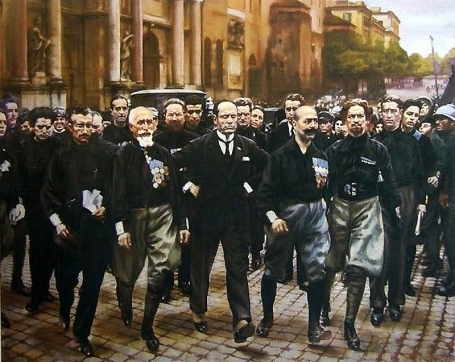 The earliest 'Fasci di Combattimento' were created in 1919 by Mussolini, who at the time enjoyed some popularity as the editor of the Il Popolo d'Italia. The Fascists saw the destruction of Italian socialism as their primary job.